I am honoured to participate in this blog hop featuring artists around the world. I was invited by talented artist and intuitive reader Adrienne Vita along with the illustrator Marta Berk to participate. Why do I create what I do? I never know exactly what it is I'm about to create next actually. I let spirit guide me and am often surprised by what comes out, but this is all part of the creative process, non? I do know that whatever I create is exactly what i need at that moment to grow my creative soul. My creative work anchors me to the Divine and is often exactly what i need to help guide me along my path emotionally and intuitively. Which work? I have so many different styles: cartooney...abstract...detailed realism...whimsical children's book illustration style...etc. Currently I'm developing a new class called "Awaken Your Creative Soul"; a creative, spiritual class where students create affirmation cards using their non dominant hand along with moon collages! I find that developing a class and teaching is an incredibly rich and satisfying experience creatively. I also continue to create more 'lefty' drawings combined with collaged words/phrases that may end up being published in upcoming Creative Soul decks that I hope to put out every year. I also channel healing songs, affirmations and Creative Soul Challenges and Body Movement exercises every New and Full Moon to accompany a Creative Soul Card chosen specifically for that Moon and shared with my class. Who inspires me to create? Francesco Clemente: Inspired by India ~ his latest exhibit at the Rubin Museum. When in doubt, twirl!" (by modern dance pioneer Ted Shawn). I recently discovered the beautiful green goddess inspired photography and jewelry of Astara Lak'ech and would like to invite everyone to hop on over to Astara's Sacred Spirit of Gaia blog as we continue on with the worldwide artist blog-hop ~ enjoy and please support artists everywhere! 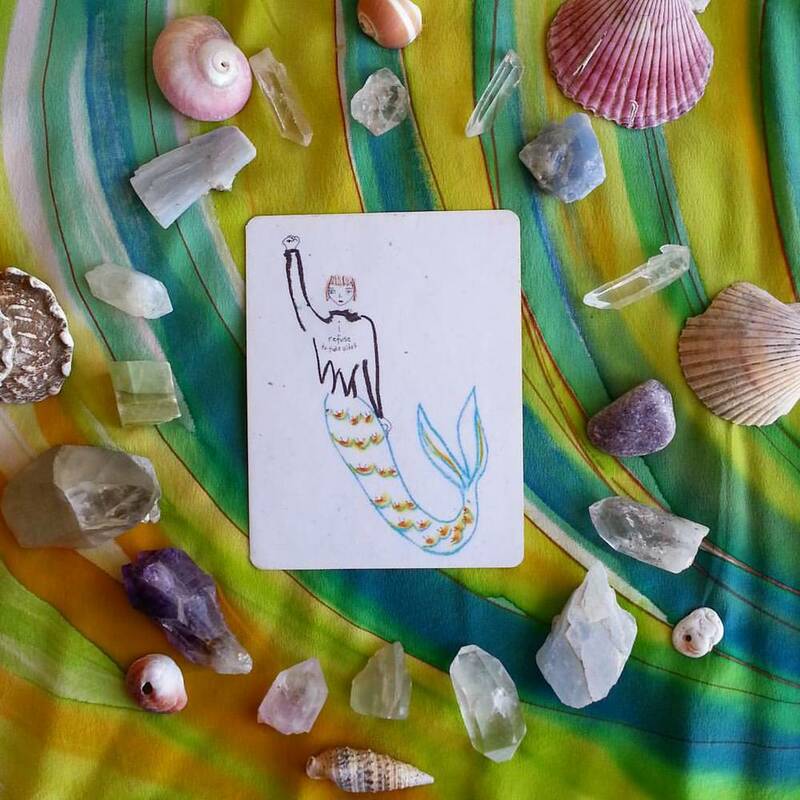 The affirmation and image in this post is from my soon to be released Creative Soul Deck and Class and was channeled by me for this Aquarius Full Moon. I have included a snippet from the Creative Soul Activity that accompanies it below. There is also a gemstone healing meditation that I channeled and will be sharing in my Creative Soul Circle, a private group on Facebook. Please email me if you'd like to join. Affirmation: Shush! I quiet my outside so my inner voice can be heard. And I open up to touch the core of me-ness. It's the lunar lammas and the first harvest (in the northern hemisphere, that is), but because it's a lunar celebration which happens this Sunday at the Full Moon in Aquarius (August 10 at 11:09 am PDT) this celebration is about our inner harvest. Allow the group mind, the myriad of voices, the universal, co-creative, collective consciousness to speak through you by listening to your heart and soul at this Full Moon in Aquarius. Allow this Full Moon to fill your soul with light for you are love and all you touch is loved. To view more images from my Creative Soul Deck please click here for prints.